The safe and high-quality tiles are useful in residential and commercial settings. You can use them on many surfaces, such as hardwood floor, laminate floor, and granite tiles. You can use the mat for splicing to better adapt to different ground requirements. Furthermore, I believe that your family and friends are also very happy to appreciate your own floor design. Waterproof interlocking floor tiles. Fit the gym floor with excellent quality, fitness for kids room, dog play flooring or even house décor purposes. Safety first with a non-toxic, lead and latex free, high density EVA foam; tiles covers 12 x 12 inch each and is about 3/8 inch thick - 9 Square Feet. Made with a high density but soft comfortable foam, these soft wood tiles turn any hard cold floor on a comfortable, safe, full-of-style surface. 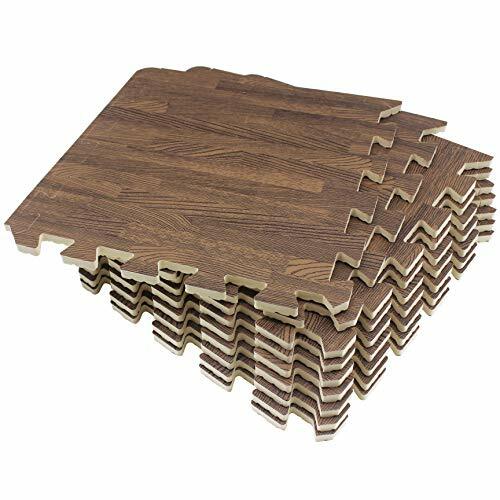 Versatile puzzle wood mats allow to remove or reconnect pieces according to furniture style or exercise necessity; more mats can be added anytime. The soft classic wood grain foam auto mats that you can afford, with the quality and good taste that you need.